LTR Weekend: The LTR program begins with an orientation weekend, held from 8:00 am to 12:00 pm on Saturday and Sunday. Attendance both days is MANDATORY. Orientation culminates with a fun club-wide barbecue that allows new rowers to meet club members. 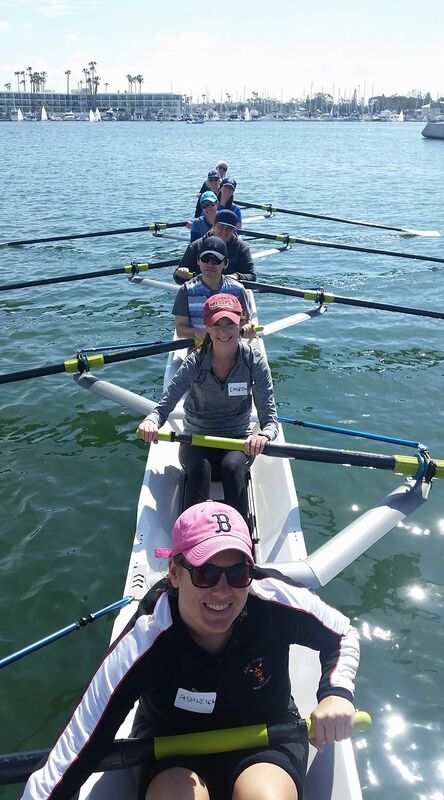 You will learn fundamentals of rowing, boat-handling skills and safety. Rowing technique is practiced first on the ergometer (rowing machine) and then you will actually get into a boat and ROW on the water! After this introductory weekend, LTR rowers have the opportunity to participate in free rows during the following week and weekend. If you decide to commit to the program, you will be asked to join LARC and attend LTR instructed rows at least twice a week for the next 6 months. Most Saturday rows also include coaching. LTR rowers may be invited to advance into novice boats at the end of their first three months; these members will still be required to row at least once per week in an LTR boat. 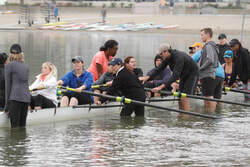 Twice a year, the Los Angeles Rowing Club (LARC) conducts a Learn-to-Row (LTR) program to teach the sport of rowing to adults with no prior sweep rowing experience or to those who want a refresher course. The course is taught by experienced club volunteers. The Spring session usually kicks off late March or early April and the Fall session usually begins mid-September or early October. Each class is limited to 20 individuals per session. See you out on the water!! !